For skeptics looking for appealing ways to approach their believing friends or believers who are not afraid to consider a skeptical challenge, this book makes for very stimulating reading. Many books that challenge religious belief from a skeptical point of view take a combative tone that is almost guaranteed to alienate believers or they present complex philosophical or scientific arguments that fail to reach the average reader.This is undoubtably an ineffective way of encouraging people to develop critical thinking about religion. This is a unique approach to skepticism regarding that presents fifty commonly heard reasons people often give for believing in a God and then he raises legitimate questions regarding these reasons, showing in each case that there is much room for doubt.Whether you're a believer, a complete skeptic, or somewhere in between, you'll find this review of traditional and more recent arguments for the existence of God refreshing, approachable, and enlightening. From religion as the foundation of morality to the authority of sacred books, the compelling religious testimony of influential people, near-death experiences, arguments from Intelligent Design, and much more, Harrison respectfully describes each rationale for belief and then politely shows the deficiencies that any good skeptic would point out. As a journalist who has traveled widely and interviewed many highly accomplished people, quite a number of whom are believers, the author appreciates the variety of belief and the ways in which people seek to make religion compatible with scientific thought. Nonetheless, he shows that, despite the prevalence of belief in gods or religious belief in intelligent people, in the end there are no unassailable reasons for believing in a god. "There's an excellent American publishing house, Prometheus Books, which specializes in agnostic and atheist subjects. 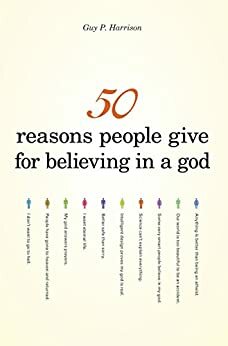 I've just finished reading Fifty Reasons People Give for Believing in a God, by Guy P. Harrison. In this thought-provoking book, Harrison makes a powerful case against religion without the need for name-calling, contempt or condescension. "Harrison has hit the right mix. He does not coddle or kowtow to believers, but he has a pleasant way of writing. One can almost imagine that he is smiling as he writes--not a sardonic smile but a real, life-affirming, comfortable-with-who-I-am smile. His joyful embrace of the natural world and humanity in all its triumphs along with low points and his admission that he does not understand everything he encounters makes this author's atheism a very happy state of being." Having read some of Harrison's other work, I knew what to expect here: clear and concise arguments illustrated by colorful analogy and well-crafted storytelling. This book certainly delivered on that front. Easy to read and very interesting, this book is presented in easily digestible short chapters, though the "50" idea comes across at times as a bit forced and gimmicky. At one point Harrison even admits "I debated even putting this chapter in the book..." But apparently since he had to have 50, it made it in. Also, Harrison goes out of his way to state that he is NOT anti-religion and that he always tries to be gracious and understanding in conversation with believers (which certainly may be the case), but then as the book wears on, his tone becomes increasingly intolerant of religious viewpoints, at times referring to them as silly an ridiculous. It seems a bit hypocritical to me. These are small complaints, however, and most readers will gain at least something from a trek through Harrison's discourse. An enjoyable read from a gifted writer and observer of the world. 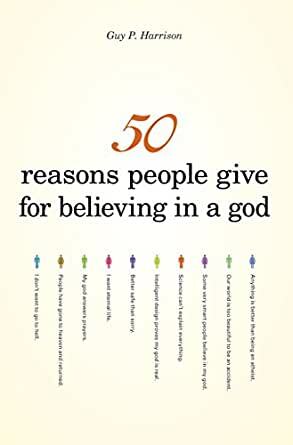 A logical and thoughtful, yes even entertaining approach to the reasons people give for believing in a god...and the author's masterful refutation of them. Elegant, snappy, and NOT condescending to anyone...I would NOT hesitate to say "beautiful!" Buy 2 copies...one for yourself, and one for loaning out to inquiring minds. One of the single best books I have ever encountered concerning belief. I cannot recommend it enough! I highly recommend this book. The author’s conversational style is refreshing, and his thoughtful treatment of difficult questions is very helpful. Anyone interested in religion, believer or not, would gain much insight from reading this book. 5.0 out of 5 stars50 reasons for nonbelievers to not believe...but in a nicer way. As you can tell from the title, this book may still be mainly for the nonbelievers. Sure, there are some believers that like to challenge what they believe with reading books that go against the grain of their own belief, but they would be rare. Most believers are very afraid to question anything, as doubt may creep in. This book, therefore, will not likely convince the believers, but it is a great overview of 50 lines of argumentation for and against belief in a god or gods, with references to works that go into much greater detail, arguably one of the most useful aspects of the book. For the honest questioner, reading this book can make one really question why their belief is unique and true, especially amidst a world of beliefs that are wide-ranging and geographically diverse. As a bonus, the writer is entertaining and witty, and has a positive attitude about life as a nonbeliever, delivering a fresh view of various arguments put forward by believers he has encountered all over the world. Perhaps the best parts of the book are the stories he tells about things that have happened to him in his travels, many humorous. Harrison seems somewhat sympathetic to believers as fellow humans trying to find their way, not abrasive as a few writing about religion have been in recent years. I understand their points as well, but this book is the one I would allow my religious family and friends to read as representing my viewpoint, as it would not embarrass me as much.